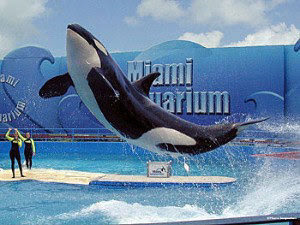 Parques Reunidos May Buy Miami Seaquarium?! Oh No, Don't Do It! It's a TRAP! According tot he Miami Herald, Palace Entertainment, the US branch of Parques Reunidos may be looking to buy the Miami Seaquairum for a reported $30 Million. The Herald reports that their source said a nondisclosure agreement has been signed while the buyer completes the process. While many people right now are focusing wrongly on Seaworld for animal rights and treatement of their Killer Whales, the Miami Seaquarium has a much darker and twisted history. Much of it not good and while Blackfish may be all the news right now, people should focus their efforts someplace that needs the spotlight placed on them. Don't believe me? Do some googling- you'll find out better that way and my opinion won't cloud your own judgement (it's bad). Palace Entertainment has already proven to funnel money from their US amusement parks and properties into their massive building projects in Europe. There is no other way to explain the complete lack of care and declining state of their US park properties, I can't imagine that Miami Seaquairum (which desperately needs money for massive improves to their animal keep facilities) would benefit from this deal.